Thrust, drag, lift, and weight are forces that act upon all aircraft in flight. Understanding how these forces work and knowing how to control them with the use of power and flight controls are essential to flight. Thrust—the forward force produced by the powerplant/propeller or rotor. It opposes or overcomes the force of drag. As a general rule, it acts parallel to the longitudinal axis. However, this is not always the case, as explained later. Drag—a rearward, retarding force caused by disruption of airflow by the wing, rotor, fuselage, and other protruding objects. 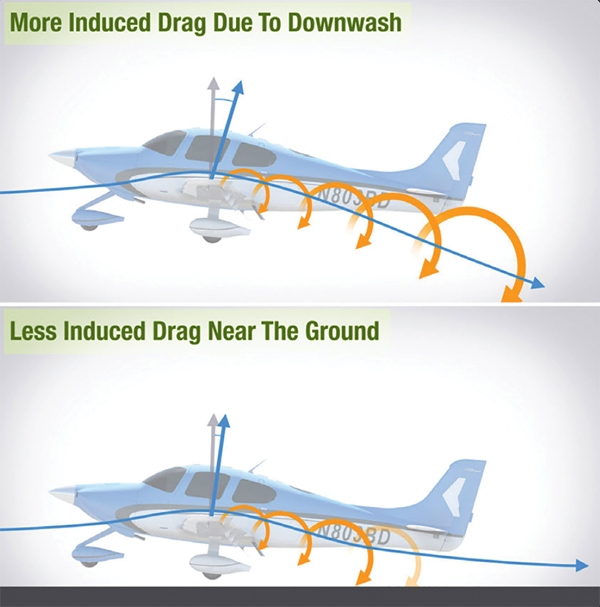 As a general rule, drag opposes thrust and acts rearward parallel to the relative wind. Lift—is a force that is produced by the dynamic effect of the air acting on the airfoil, and acts perpendicular to the flight path through the center of lift (CL) and perpendicular to the lateral axis. 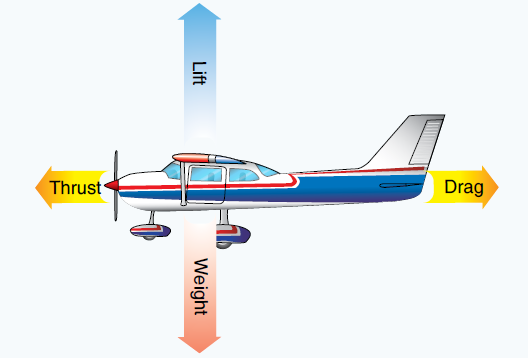 In level flight, lift opposes the downward force of weight. Weight—the combined load of the aircraft itself, the crew, the fuel, and the cargo or baggage. Weight is a force that pulls the aircraft downward because of the force of gravity. It opposes lift and acts vertically downward through the aircraft’s center of gravity (CG). In steady flight, the sum of these opposing forces is always zero. There can be no unbalanced forces in steady, straight flight based upon Newton’s Third Law, which states that for every action or force there is an equal, but opposite, reaction or force. This is true whether flying level or when climbing or descending. In glides, a portion of the weight vector is directed along the forward flight path and, therefore, acts as thrust. In other words, any time the flight path of the aircraft is not horizontal, lift, weight, thrust, and drag vectors must each be broken down into two components. 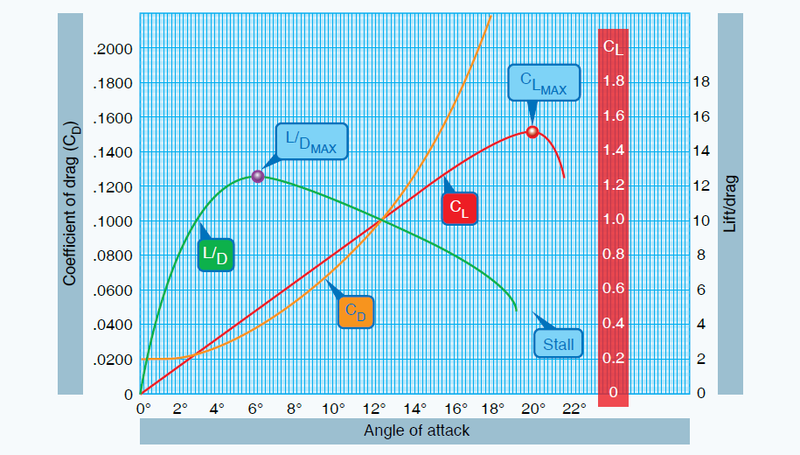 Another important concept to understand is angle of attack (AOA). Since the early days of flight, AOA is fundamental to understanding many aspects of airplane performance, stability, and control. The AOA is defined as the acute angle between the chord line of the airfoil and the direction of the relative wind. Discussions of the preceding concepts are frequently omitted in aeronautical texts/handbooks/manuals. The reason is not that they are inconsequential, but because the main ideas with respect to the aerodynamic forces acting upon an aircraft in flight can be presented in their most essential elements without being involved in the technicalities of the aerodynamicist. In point of fact, considering only level flight, and normal climbs and glides in a steady state, it is still true that lift provided by the wing or rotor is the primary upward force, and weight is the primary downward force. By using the aerodynamic forces of thrust, drag, lift, and weight, pilots can fly a controlled, safe flight. A more detailed discussion of these forces follows. For an aircraft to start moving, thrust must be exerted and be greater than drag. The aircraft continues to move and gain speed until thrust and drag are equal. In order to maintain a constant airspeed, thrust and drag must remain equal, just as lift and weight must be equal to maintain a constant altitude. If in level flight, the engine power is reduced, the thrust is lessened, and the aircraft slows down. As long as the thrust is less than the drag, the aircraft continues to decelerate. To a point, as the aircraft slows down, the drag force will also decrease. The aircraft will continue to slow down until thrust again equals drag at which point the airspeed will stabilize. Likewise, if the engine power is increased, thrust becomes greater than drag and the airspeed increases. As long as the thrust continues to be greater than the drag, the aircraft continues to accelerate. When drag equals thrust, the aircraft flies at a constant airspeed. Straight-and-level flight may be sustained at a wide range of speeds. The pilot coordinates AOA and thrust in all speed regimes if the aircraft is to be held in level flight. An important fact related to the principal of lift (for a given airfoil shape) is that lift varies with the AOA and airspeed. Therefore, a large AOA at low airspeeds produces an equal amount of lift at high airspeeds with a low AOA. The speed regimes of flight can be grouped in three categories: lowspeed flight, cruising flight, and high-speed flight. 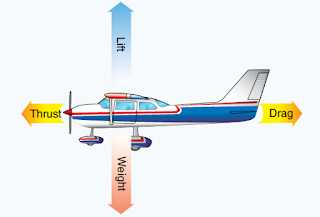 When the airspeed is low, the AOA must be relatively high if the balance between lift and weight is to be maintained. 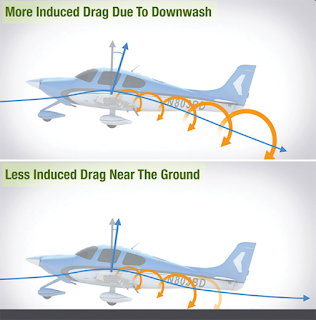 [Figure 3] If thrust decreases and airspeed decreases, lift will become less than weight and the aircraft will start to descend. To maintain level flight, the pilot can increase the AOA an amount that generates a lift force again equal to the weight of the aircraft. While the aircraft will be flying more slowly, it will still maintain level flight. The AOA is adjusted to maintain lift equal weight. The airspeed will naturally adjust until drag equals thrust and then maintain that airspeed (assumes the pilot is not trying to hold an exact speed). Straight-and-level flight in the slow-speed regime provides some interesting conditions relative to the equilibrium of forces. 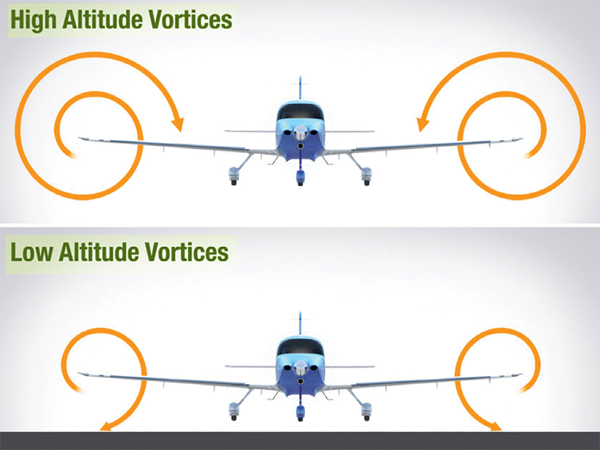 With the aircraft in a nose-high attitude, there is a vertical component of thrust that helps support it. For one thing, wing loading tends to be less than would be expected. In level flight, when thrust is increased, the aircraft speeds up and the lift increases. The aircraft will start to climb unless the AOA is decreased just enough to maintain the relationship between lift and weight. The timing of this decrease in AOA needs to be coordinated with the increase in thrust and airspeed. Otherwise, if the AOA is decreased too fast, the aircraft will descend, and if the AOA is decreased too slowly, the aircraft will climb. As the airspeed varies due to thrust, the AOA must also vary to maintain level flight. At very high speeds and level flight, it is even possible to have a slightly negative AOA. As thrust is reduced and airspeed decreases, the AOA must increase in order to maintain altitude. If speed decreases enough, the required AOA will increase to the critical AOA. Any further increase in the AOA will result in the wing stalling. Therefore, extra vigilance is required at reduced thrust settings and low speeds so as not to exceed the critical angle of attack. If the airplane is equipped with an AOA indicator, it should be referenced to help monitor the proximity to the critical AOA. The pilot can control the lift. Any time the control yoke or stick is moved fore or aft, the AOA is changed. As the AOA increases, lift increases (all other factors being equal). When the aircraft reaches the maximum AOA, lift begins to diminish rapidly. This is the stalling AOA, known as CL‑MAX critical AOA. Examine Figure 5, noting how the CL increases until the critical AOA is reached, then decreases rapidly with any further increase in the AOA. The above lift equation exemplifies this mathematically and supports that doubling of the airspeed will result in four times the lift. As a result, one can see that velocity is an important component to the production of lift, which itself can be affected through varying AOA. When examining the equation, lift (L) is determined through the relationship of the air density (ρ), the airfoil velocity (V), the surface area of the wing (S) and the coefficient of lift (CL) for a given airfoil. Taking the equation further, one can see an aircraft could not continue to travel in level flight at a constant altitude and maintain the same AOA if the velocity is increased. The lift would increase and the aircraft would climb as a result of the increased lift force or speed up. Therefore, to keep the aircraft straight and level (not accelerating upward) and in a state of equilibrium, as velocity is increased, lift must be kept constant. This is normally accomplished by reducing the AOA by lowering the nose. Conversely, as the aircraft is slowed, the decreasing velocity requires increasing the AOA to maintain lift sufficient to maintain flight. There is, of course, a limit to how far the AOA can be increased, if a stall is to be avoided. Notice in Figure 5 that the coefficient of lift curve (red) reaches its maximum for this particular wing section at 20° AOA and then rapidly decreases. 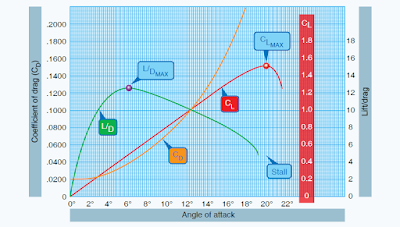 20° AOA is therefore the critical angle of attack. The coefficient of drag curve (orange) increases very rapidly from 14° AOA and completely overcomes the lift curve at 21° AOA. The lift/drag ratio (green) reaches its maximum at 6° AOA, meaning that at this angle, the most lift is obtained for the least amount of drag. Note that the maximum lift/drag ratio (L/DMAX) occurs at one specific CL and AOA. If the aircraft is operated in steady flight at L/DMAX, the total drag is at a minimum. Any AOA lower or higher than that for L/DMAX reduces the L/D and consequently increases the total drag for a given aircraft’s lift. 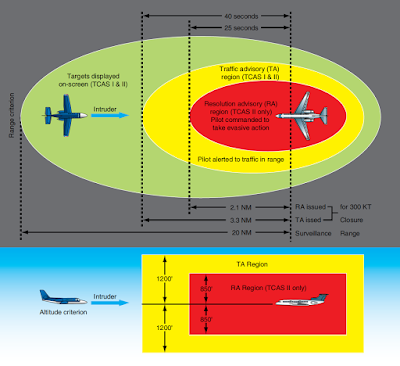 Figure 6 depicts the L/DMAX by the lowest portion of the blue line labeled “total drag.” The configuration of an aircraft has a great effect on the L/D. Drag is the force that resists movement of an aircraft through the air. There are two basic types: parasite drag and induced drag. The first is called parasite because it in no way functions to aid flight, while the second, induced drag, is a result of an airfoil developing lift. Parasite drag is comprised of all the forces that work to slow an aircraft’s movement. As the term parasite implies, it is the drag that is not associated with the production of lift. This includes the displacement of the air by the aircraft, turbulence generated in the airstream, or a hindrance of air moving over the surface of the aircraft and airfoil. There are three types of parasite drag: form drag, interference drag, and skin friction. 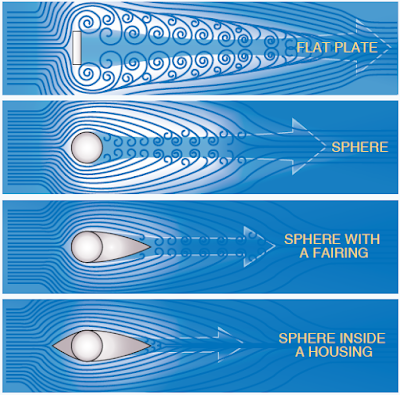 Notice how the flat plate in Figure 7 causes the air to swirl around the edges until it eventually rejoins downstream. Form drag is the easiest to reduce when designing an aircraft. The solution is to streamline as many of the parts as possible. Skin friction drag is the aerodynamic resistance due to the contact of moving air with the surface of an aircraft. Every surface, no matter how apparently smooth, has a rough, ragged surface when viewed under a microscope. The air molecules, which come in direct contact with the surface of the wing, are virtually motionless. Each layer of molecules above the surface moves slightly faster until the molecules are moving at the velocity of the air moving around the aircraft. This speed is called the free-stream velocity. The area between the wing and the free-stream velocity level is about as wide as a playing card and is called the boundary layer. At the top of the boundary layer, the molecules increase velocity and move at the same speed as the molecules outside the boundary layer. The actual speed at which the molecules move depends upon the shape of the wing, the viscosity (stickiness) of the air through which the wing or airfoil is moving, and its compressibility (how much it can be compacted). The airflow outside of the boundary layer reacts to the shape of the edge of the boundary layer just as it would to the physical surface of an object. The boundary layer gives any object an “effective” shape that is usually slightly different from the physical shape. The boundary layer may also separate from the body, thus creating an effective shape much different from the physical shape of the object. This change in the physical shape of the boundary layer causes a dramatic decrease in lift and an increase in drag. When this happens, the airfoil has stalled. In order to reduce the effect of skin friction drag, aircraft designers utilize flush mount rivets and remove any irregularities that may protrude above the wing surface. In addition, a smooth and glossy finish aids in transition of air across the surface of the wing. Since dirt on an aircraft disrupts the free flow of air and increases drag, keep the surfaces of an aircraft clean and waxed. The second basic type of drag is induced drag. It is an established physical fact that no system that does work in the mechanical sense can be 100 percent efficient. This means that whatever the nature of the system, the required work is obtained at the expense of certain additional work that is dissipated or lost in the system. The more efficient the system, the smaller this loss. In level flight, the aerodynamic properties of a wing or rotor produce a required lift, but this can be obtained only at the expense of a certain penalty. The name given to this penalty is induced drag. Induced drag is inherent whenever an airfoil is producing lift and, in fact, this type of drag is inseparable from the production of lift. Consequently, it is always present if lift is produced. An airfoil (wing or rotor blade) produces the lift force by making use of the energy of the free airstream. Whenever an airfoil is producing lift, the pressure on the lower surface of it is greater than that on the upper surface (Bernoulli’s Principle). As a result, the air tends to flow from the high pressure area below the tip upward to the low pressure area on the upper surface. In the vicinity of the tips, there is a tendency for these pressures to equalize, resulting in a lateral flow outward from the underside to the upper surface. This lateral flow imparts a rotational velocity to the air at the tips, creating vortices that trail behind the airfoil. When the aircraft is viewed from the tail, these vortices circulate counterclockwise about the right tip and clockwise about the left tip. 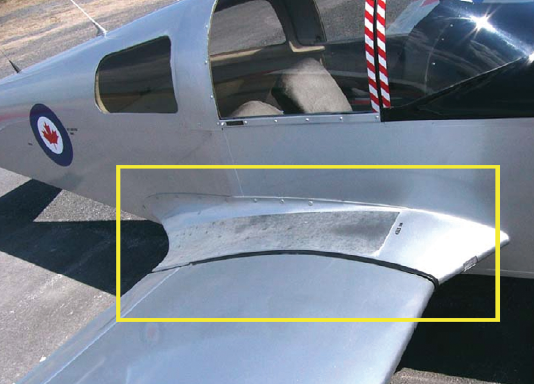 [Figure 9] As the air (and vortices) roll off the back of your wing, they angle down, which is known as downwash. Figure 10 shows the difference in downwash at altitude versus near the ground. 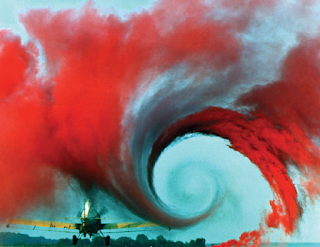 Bearing in mind the direction of rotation of these vortices, it can be seen that they induce an upward flow of air beyond the tip and a downwash flow behind the wing’s trailing edge. This induced downwash has nothing in common with the downwash that is necessary to produce lift. It is, in fact, the source of induced drag. Downwash points the relative wind downward, so the more downwash you have, the more your relative wind points downward. That's important for one very good reason: lift is always perpendicular to the relative wind. In Figure 11, you can see that when you have less downwash, your lift vector is more vertical, opposing gravity. And when you have more downwash, your lift vector points back more, causing induced drag. On top of that, it takes energy for your wings to create downwash and vortices, and that energy creates drag. Figure 11. The difference in downwash at altitude versus near the ground. The greater the size and strength of the vortices and consequent downwash component on the net airflow over the airfoil, the greater the induced drag effect becomes. This downwash over the top of the airfoil at the tip has the same effect as bending the lift vector rearward; therefore, the lift is slightly aft of perpendicular to the relative wind, creating a rearward lift component. This is induced drag. In order to create a greater negative pressure on the top of an airfoil, the airfoil can be inclined to a higher AOA. If the AOA of a symmetrical airfoil were zero, there would be no pressure differential, and consequently, no downwash component and no induced drag. 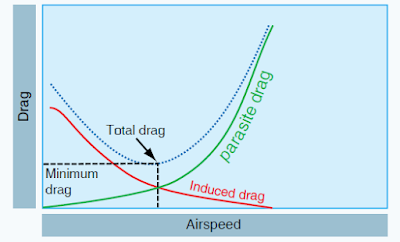 In any case, as AOA increases, induced drag increases proportionally. To state this another way—the lower the airspeed, the greater the AOA required to produce lift equal to the aircraft’s weight and, therefore, the greater induced drag. The amount of induced drag varies inversely with the square of the airspeed. Conversely, parasite drag increases as the square of the airspeed. Thus, in steady state, as airspeed decreases to near the stalling speed, the total drag becomes greater, due mainly to the sharp rise in induced drag. Similarly, as the aircraft reaches its never-exceed speed (VNE), the total drag increases rapidly due to the sharp increase of parasite drag. As seen in Figure 6, at some given airspeed, total drag is at its minimum amount. In figuring the maximum range of aircraft, the thrust required to overcome drag is at a minimum if drag is at a minimum. The minimum power and maximum endurance occur at a different point. Gravity is the pulling force that tends to draw all bodies to the center of the earth. The CG may be considered as a point at which all the weight of the aircraft is concentrated. If the aircraft were supported at its exact CG, it would balance in any attitude. It will be noted that CG is of major importance in an aircraft, for its position has a great bearing upon stability. The allowable location of the CG is determined by the general design of each particular aircraft. The designers determine how far the center of pressure (CP) will travel. It is important to understand that an aircraft’s weight is concentrated at the CG and the aerodynamic forces of lift occur at the CP. When the CG is forward of the CP, there is a natural tendency for the aircraft to want to pitch nose down. If the CP is forward of the CG, a nose up pitching moment is created. Therefore, designers fix the aft limit of the CG forward of the CP for the corresponding flight speed in order to retain flight equilibrium. Weight has a definite relationship to lift. This relationship is simple, but important in understanding the aerodynamics of flying. Lift is the upward force on the wing acting perpendicular to the relative wind and perpendicular to the aircraft’s lateral axis. Lift is required to counteract the aircraft’s weight. 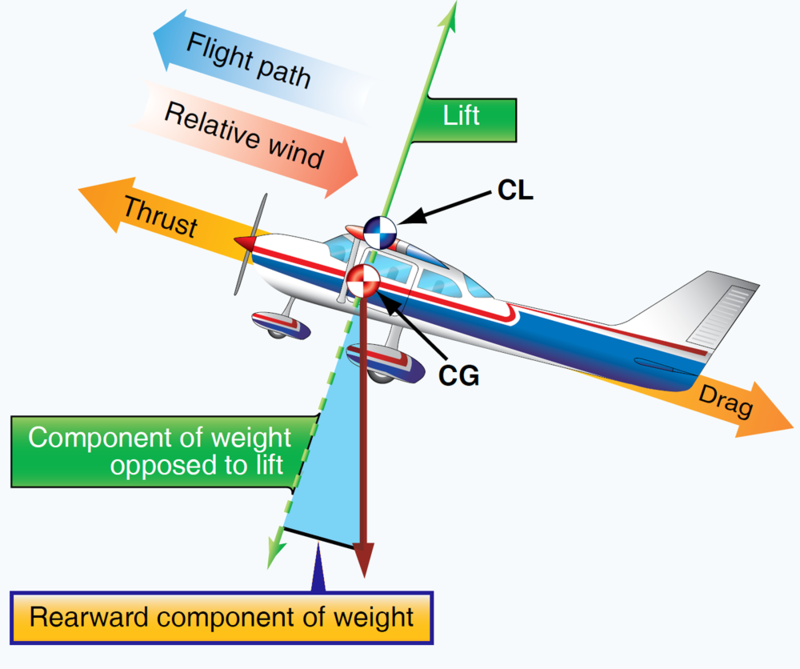 In stabilized level flight, when the lift force is equal to the weight force, the aircraft is in a state of equilibrium and neither accelerates upward or downward. If lift becomes less than weight, the vertical speed will decrease. When lift is greater than weight, the vertical speed will increase.